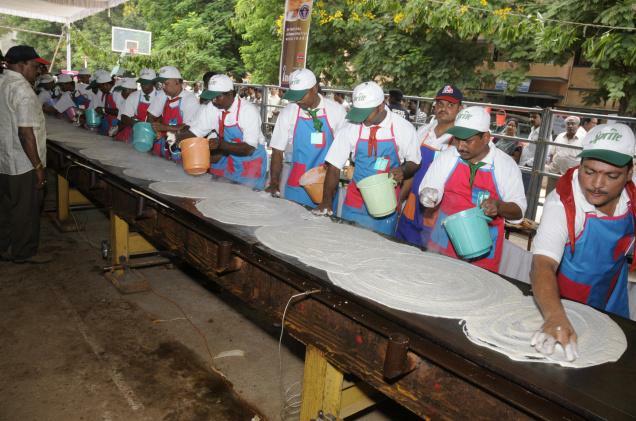 A 38.2 feet long dosa cooked by Vijayawada Hotels Association has entered into the Guinness Book of Records as being the biggest dosa ever made. The dosa was cooked by the association to mark its Golden Jubilee celebrations here today. The record was announced by the representative of Guinness Book of Records Elizebeth Smith in the presence of Union Minister for Tourism Subodh Kant Sahay, Union Minister of State for Human Resources D Purandeswari and many other dignitaries. The President of the Hotels Association Pattabhi said it has broken the record that was earlier held by Sankalp Hotel in Mumbai which had cooked 32.5 ft long dosa to make it to the Guinness Book.